When you open or a foreign language document from the Document Viewer page, we recommend that you use Google Translate to translate a section of text or document into English. In the search box enter the text or keywords which can be either in English or its original language, then Click on the 'Search' button. The results will be displayed in the main table for all documents according to your search in the Current Case. In multiple cases and high volume of documents, ‘Filter’ section will narrow the search and show the documents you typed specific information. You can filter foreign documents from the Browse, Search and Analysis>Case Notes and Facts & Issues pages. 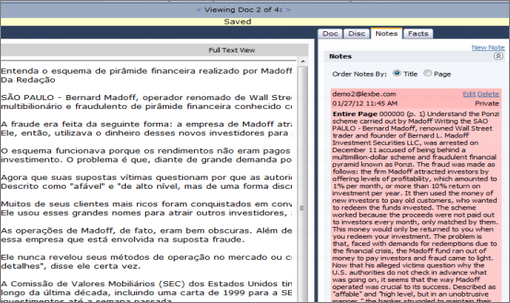 If you wish to see all document notes at one time, you can do so in the Case Notes page.